If you have long hair or someone in your family has long hair it is just a matter of time before your bathroom sink is going to clog. The water drains slowly or not at all. Maybe the shower drain is not draining quickly enough leaving soapy scum at the bottom of the shower. The worst clogged drain situation is the toilet. At best it just does not flush. At worst it overflows. What a mess. 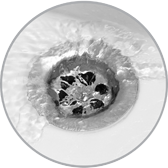 The clogged drain regardless of which drain it is must be cleared and quickly. A professional plumber can unclog your drain. They will clear out all of the material that is getting in the way of water draining out of your sink etc. They will also make sure that whatever is blocking your drainage pipes is either removed or pushed down the drain to larger pipes where it will drain properly into city sanitary sewers. Some homeowners may try to clean drains themselves. They risk damaging the sink, the shower floor or toilet making their problems much worse. Avoid using chemicals which dissolve material blocking drains. Not only do you risk damaging your pipes by using these chemicals, you also risk damaging pipes under your basement and out to the street. Hiring a professional plumbing company to clear your clogged drain is one of the safest ways to deal with the problem. They can determine where the stoppage is located, whether it is caused by material you have washed down the drain or whether it is from tree roots. Tree roots are often the cause of blocked drains in older homes and unfortunately occur between the outside foundation of the home and the street where your drain connects with city sewers. Hire a professional to determine where you have Clogged Drains in Chandler AZ, clean your clogged drain if possible or make recommendations regarding dealing with larger problems such as tree roots damaging your sewer connection.